When we last left Buck in the previous episode, he had gone solo to the “Three Rings,” and encountered the mysterious “little girl.” Well, it turned out that while Buck was momentarily distracted, she conveniently vanished. Meanwhile, ailing team leader Trapper re-entered the scene, and collected Buck and Huckleberry. He directed them to collect Jeff, which Willy and Wild Bill did, pursued in their truck by the other team. Jeff related that the rogue team had a building deep in the woods where secrets resided, and Buck was sent by Trapper back to the shed where photos of the AIMS team had been found on the walls. Stripping these pictures off the walls, Buck found the words, “Find the blood skull, find the Woman of the Woods” painted on the walls. The Rogue Team’s cabin described by Jeff was found by the rest of the team, and Willy and Wild Bill entered it, guns at the ready. In a back room of the cabin, they found skulls decorating the walls and a topographical map of the dark forest. Buck then called Huckleberry from the woods, relating that he felt a foreign object was the cause of Jeff’s frequent nosebleeds; Buck had remarked in a previous episode that he knew why Jeff’s nose bled, and he may have received this knowledge as ‘the chosen one” from the little girl during his “lost time.” Well, Jeff was reclined on a table, and in a gross scene the team used a forceps to extract what turned out to be a small skull-like object from his nose…there was screaming and blood. — Yes, the secret of the Dark Woods was not under Jeff’s nose, but up it! Eww! In the previous episode of “Mountain Monsters,” Jeff was seen wandering around three large grapevine rings in the Dark Forest while carrying a torch. In S5/Ep7 it was learned that Jeff had met with the boss of the other team, and had been shown a ritual for the Three Rings constructions that was supposed to draw the “little girl” of great interest to that other team. Buck in that meeting with Jeff shared his “lost time” in the woods when he ditched his cameraman and wandered about in a trance-like state following which time he was not immediately aware of what had happened. A video was on Buck’s cell phone from that time which showed the enigmatic little girl, who it was deduced was the key to what the other team was looking for. Jeff was sent back to tell the other team that he knew someone who had talked to the little girl. This lure worked all too well, with the other team descending on the AIMS base camp with firearms, threatening to burn them out if they failed to surrender Buck, who had hidden in the woods near the base camp. Managing to steal one of the other team’s trucks, he led them away in it, and hid until the next morning. Meeting at that time with Huckleberry, Buck decided to go back north to the Three Rings area alone, with the rest of the team asked to create a diversion in the south to lure the other team away. They did this by setting off trip wires of the other team, and dropped a tree across the road to slow that team’s exit, setting it afire for dramatic effect. Skipping now the “Superfan” episode of the previous week which basically served to recycle old material, S5/Ep5 of Mountain Monsters picked up with Jeff and Trapper being found in a barn by the rest of the AIMS team. It turned out that Jeff was basically working as a double agent, working with “Harry and Stinky” of the other team to gather information. Jeff advised his team mates to download video from a tripped trail camera, which they did only to find it password protected. 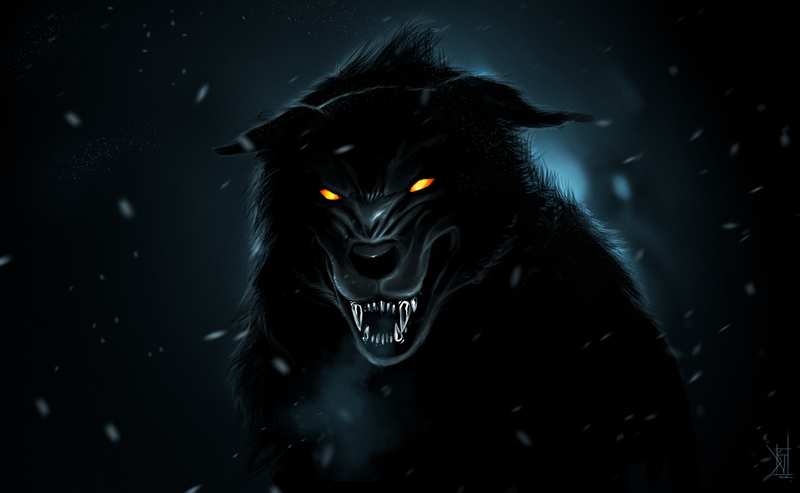 Jeff later supplied the password , and the video revealed an image of…the Black Wolf! At a night meeting with Jeff, Buck was told that “something big” would be going on by a high rock wall. Buck became lost in the woods, sending the rest of his teammates by phone to the designated location. Willy and Wild Bill rappelled down the wall in order to listen, with Willy managing to steal a radio of the other team to facilitate this process. On the radio, it was heard that Jeff was down and bleeding. Fearing that he was gunshot, Willy and Wild Bill hastened to that location, finding Jeff down with one of his gradually-worsening nose bleeds. Meanwhile still lost in the woods, Buck heard the laughter of the “Woman in the Woods,” wandering off in a daze for ninety minutes before being located by his cameraman. Not to be confused with the Phantom of the Opera, the Phantom of the Forest as presented in S4/Ep11 of Mountain Monsters is yet another Bigfoot clone standing about 6-1/2′ tall and weighing in at about 500 lbs. with brownish gray fur. First seen by the Shawnee Indians in the 1700’s, the Phantom is reported having a special attachment to deer, and by some accounts has been seen riding them despite the obvious weight overload that would be involved. Traveling to Wood County in West Virginia, the AIMS team first met with “Dan,” a farmer, who described an encounter where he heard gunshots following which he saw a number of dead deer, the apparent victims of poachers who were in a truck. The eyewitness then saw a Bigfoot at the tree line who charged the poacher’s truck, lifting it up on two wheels and causing them to beat a hasty retreat. During their first night’s investigation, the team saw a bent-over tree, then heard a crash with a tree being thrown down near them. They felt themselves being observed, and shortly thereafter heard gunshots apparently aimed in their direction, presumably by the poachers. The next day, the team returned to the general area, finding what they called a homemade silencer commonly used by poachers to mute gunshots. They also found a handwritten note tacked to a tree stating, “Something’s stalking me,” and signed “Ernie.” Meanwhile, “Wild Bill” in a used police cruiser that he had picked up met with “Willy,” and together the two constructed a “Pyramid trap” to cage the Bigfoot. Also that day, “Buck” and “Jeff” met with the poachers by their invitation, keeping an armed “Huckleberry” in the background as backup. The poachers claimed sighting the Bigfoot, said that he had torn up their buddy pretty badly, and announced their intentions of killing him. “Buck” took the poachers to task for being poachers, which resulted in a Mexican standoff of sorts with guns, and colorful language being exchanged before the poachers departed in their vehicle, issuing threats. Once again, we are off to the Bigfoot races on the S4/Ep08 installment of Mountain Monsters, the Raven Mocker. First seen by Cherokees in the early 1700’s, this Bigfoot variant is described as standing 7′ tall, weighing 500 lbs., and having black fur with all-white eyes. Where it gets freaky is that this Bigfoot is a kind of shape-shifter that can enter the soul of a raven, seeing from the aerial perspective of that bird, like the warg or “skin shifter” on Game of Thrones. Furthermore, they could change into any animal. Before a kill, the Raven Mocker is said to call out like a raven. They are said to consume the hearts of men. — Creepy, huh? Well, our “hard-core hunters and trackers” first interviewed “Mike,” an outdoorsman who reported seeing a wrenched-off deer’ s head hanging in a tree. In the same vicinity, he reported seeing 16″ footprints, plus smaller ones apparently those of a human female! This raised the unanswered questions of whether the Bigfoot shape- shifted to a human female (a really bad date), or traveled with a human female who had a thing for big, hairy guys. During their first night’s hunt, the team saw a tree structure, heard humming and then an “evil laugh,” perceived something running, and saw a number of humanoid-shaped stick constructions hanging. The next day, they found raven prints, and when team member “Buck” made a raven call, tree knocks were heard in apparent response. A bow hunter named “Scott” was interviewed who reported seeing a dead buck with a broken neck. He produced a photo showing a blurry dark object against a dark background. During the daylight hours, “Willy” with the assistance of “Wild Bill” had constructed a “steel cage raven wing trap” which was baited with deer meat. Contending that they had found something that was “not human” and “supernatural,” the Raven Mocker saga was continued in another episode airing two weeks after the first. Seeking guidance from recovering team leader “Trapper,” the team was admonished to go back to their “Native American roots,” and seek answers from where there was physical evidence of the Raven Mocker. Returning to the woods in Lee County, Virginia at night, the team encountered again the “burning man” style tree structures, as well as footprints in the mud that were smaller and appeared to be those of a woman. They heard mocking-type laughter, and then team member “Huckleberry” was brought down by a grapevine-type snare trap. Well, the team then constructed several Native American styled huts, protecting them with sage and accessories like dream catchers, snake skins, and turtle shells. They put on “warrior faces and battle uniforms,” which meant quasi-Native American garb and rather badly applied “war paint.” The men marked for death assumed places in separate huts and performed protective ceremonies, after which time a Bigfoot roar was heard together with tree knocks. “Jeff” the team researcher seemed to be targeted, with his dream catcher jerked and the roof of his hut brought down upon him. In a daze he was led off by someone in a cloak, and found by the pursuing team members at the base of a tree, bloodied and freaking out. Following a bit of a hysterical reaction, “Jeff” related that the “Old Woman of the Woods” had shown him how and when he was going to die, and then told him that he was free. This presumably got the rest of the marked men off the hook, and his associates seemed to feel that “Jeff” had taken one for the team. – – Are you not entertained? The Bigfoot Edition of Mountain Monsters on The Discovery Channel continued with the AIMS team minus recovering leader Trapper heading to Pendleton County, West Virginia is search of the Fire Ape, an 8-1/2 foot tall, 700 pound Bigfoot variant with reddish fur first spotted over 200 years ago by Native Americans. This creature is drawn and enraged by fire, with mythology maintaining that humans originally stole fire from the beast. The team first interviewed Jerry, a landowner and eyewitness who set off fireworks. Following that, his dog took off after something, and the man spotted a reddish thing that was apparently the cause of the dog’s attention. On their first night’s investigation, the team observed a mashed down “ambush spot” in the weeds, and heard something on the river bank which they pursued, resulting only in Buck falling into the creek. The reported events of the following day commenced with observations of Wild Bill’s self-training activities, which included running madly around cones. “I don’t know if he’s training, or going insane,” commented another team member. A catapult snare trap was then constructed by Willie and Wild Bill while the rest of the team returned in the daylight to the creek, seeing wild daisies move and hearing grunts. They interviewed Mark, an outdoorsman who reported having lit a fire by his cabin, thereafter hearing a commotion and supposedly seeing the creature entranced by the flames in his fire ring. He later found an 18″ footprint of which he had a picture. Reuniting, the team then tested their trap using Archie, a burlap Bigfoot they had made. On their final night’s hunt, the team then lit torches to draw the Fire Ape, and set up a fireworks station to further lure him. They found crossed trees, a usual Bigfoot sign, and were knocking on trees to draw a response. It was then that the episode’s producer appeared, all in a dither, to report that the sound man, Pablo, had vanished! Investigating, the team found the sound guy’s mic cover and sound boom, but where in the world was Pablo? They decided to light up their fireworks to distract the Fire Ape, thereby allowing the presumed apprehended Pablo to escape. 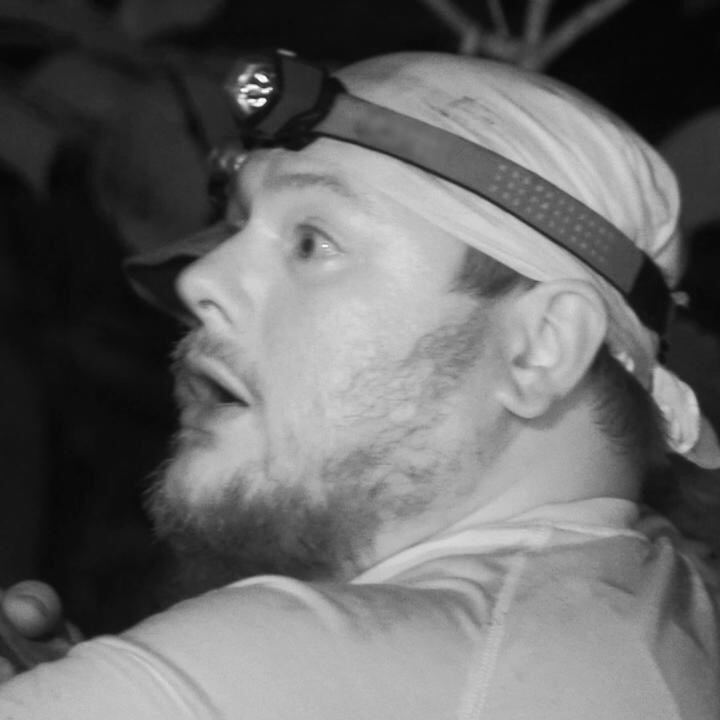 Team members thought that they heard Pablo yelling in the distance, after which time they also felt they had heard the Bigfoot yell. As the second part of the Lightning Man episode commenced on Mountain Monsters (S4, Ep04), acting team leader Buck tried to talk with the grandson of the man who owned the barn that the artifact was buried in, but was rebuffed. The team then talked with “Shannon,” a Bigfoot expert, who pronounced the stone object that they had unearthed in the barn to be a “Thunder Blade.” The “Thunder Ax,” when assembled, was the only thing that could harm the Lightning Man. Its possession was therefore both a blessing and a curse. The mythology held that the “Thunder Ax” was given in the early 1900’s to the Sutter family by Native Americans. A spellbound object, the ax kept the Lightning Man under control while buried, but the spell was broken when the ax head was dug up. The Lightning Man and Thunder Brothers wanted possession of the ax as then they wouldn’t be controlled by it, and could run rampant. If the Lightning Man touched the ax without retaining possession of it, however, it would again become spellbound and the Bigfoot controlled. There were two other components to the ax besides the blade, namely the ax handle and the lashings which bound the head to the handle. Following clues in a poetic riddle, the team then went in search of these components. A large oil drum was found in the woods which contained a pipe within which was the ax handle. A crazed redneck called “Skunky Tom” then pegged a round at the team, causing them to beat a hasty retreat with the discovered pipe. Again following clues, a pond was found with a dock beneath which was a box containing part of the ax handle lashings; apparently, not just any would do. Inconveniently, the lashings had been separated into two groupings, with the second piece put in a cabin. Following the poetic riddle (“You shall find if you seek/in the cabin by the creek“), the team located a cabin with a stove within which was a hollowed-out log containing a pipe within which was the second part of the lashing. Unfortunately the team had lit a fire within the stove, with said fire including the log in question as fuel. Not to worry, however, Huckleberry urinated on the log to extinguish the fire. – – Hey, this isn’t Masterpiece Theater, folks!